Shanghai Chiyuan Purification&Spraying Equipment Ltd.
JN series air atomizing nozzle special internal structure design can make the liquid and gas mixing, and produce fine spray or thick droplet spray droplet size. In general, by increasing the gas pressure or lower liquid pressure can get more fine droplet spray (about 30 mm), leading to higher gas flow rate and liquid flow rate ratio. Adjustable air atomizing nozzle can adjust liquid flow rate. Without changing the air pressure and fluid pressure environment, also can produce accordance with the requirements of the spray, so has a strong adaptability. Each are air cap and liquid spray cap, can provide the fan and round two spray pattern, and has a wide flow range. 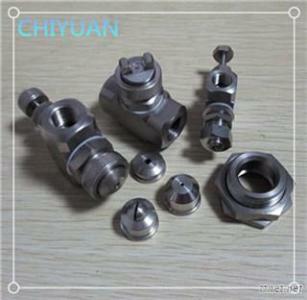 There are many kinds of size, the entrance of the nozzle body joint is suitable for most common pipe. Above the nozzle parts are interchangeable, the performance for different spray provides flexible mobility. Jacqueline Nottingham series small droplet spray, air atomizing nozzle can play a role of excellent humidification on the surrounding environment. This series of nozzle is the requirement of humidity control places ideal choice. 1. Wool praying and moistening.